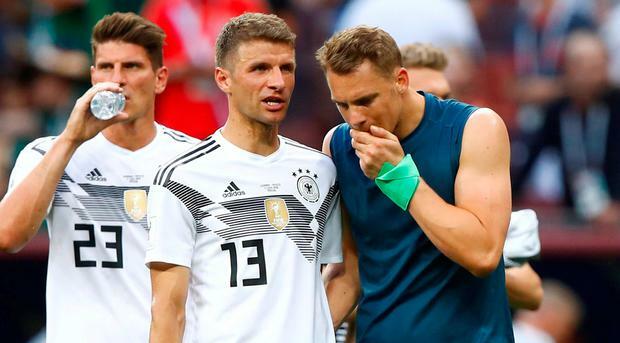 Germany woke to gloomy headlines of "chaos" and "humiliation" on Monday after the defending World Cup champions fell 1-0 to Mexico in a shock opening defeat in Russia. "Defensive chaos at the world champions," splashed the country's best-selling newspaper Bild across its sports section. "Now it is about survival at the World Cup." Berlin's Morgenpost wrote, "Germany have lost their way." "(Joachim) Low does not want to change his plan," wrote the Frankfurter Allgemeine newspaper. "Now Germany is under pressure." Low, who has been in charge since 2006 and recently signed a contract extension to 2022, also raised eyebrows a few weeks ago when he did not include Leroy Sane, the English Premier League's young player of the year, in his final World Cup squad. "Past good practices don't work anymore," wrote the Sueddeutsche Zeitung. "He cannot go on as he has done in the last 12 years." "The humiliation was homemade. Low must now change direction," said Die Welt.